Sorry I'm a couple days late with this, but I hope you all had a wonderful January, because we seem to be having quite a snowy February over here! If you live on the American east coast, I recommend making snowmen and snow dinosaurs and recreating JP scenes on your front lawn. Just don't get frostbite or I'll feel really guilty. One use of this fills up all empty troughs in a single enclosure, and the item comes with 20 uses, so it can be a real timesaver! Sorry for the delay on the monthly item, we've all been a bit scatterbrained because of New Years things :) On that note, hope everyone had a great 2013! If you didn't, let's welcome in 2014 and hope it turns out better! This month we've got the Golden Stork as the monthly item! Use it on a female dinosaur, and her next breeding will produce eight eggs, all of which you can keep! (provided you have the space for them in both your incubators and your enclosure!) There is no breeding cooldown from this item. 1) Roughard Clatterwag (#28759) with 521 snowballs thrown! 2) Brother Woodchuck (#21071) with 483 snowballs thrown! 3) The Grox (#160) with 407 snowballs thrown! 4) Jylani Amplex (#9064) with 345 snowballs thrown! 5) Cleokitty (#20090) with 345 snowballs thrown! 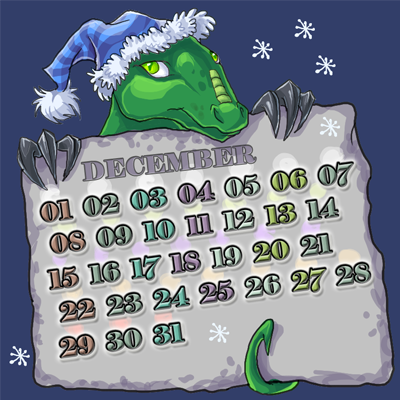 The Christmas calendar can be bought in the shop! Limited edition, only 1000 available! So hurry! Also, do remember our super-duper awesome advent calendar. It has a supercalifragilisticexpialidocious gift today! We are so sorry for the downtime last night! Unfortunately, it looks like it has caused some issues with the crons, but we are working on it. Today we have a special message from Clara! It's Clara again! Gosh, why do I keep popping up? wrapped presents every christmas. Well it's that time of year again! It even made the news now, oh my. The items in the presents range from rare goodies, large stacks of food, medicine, rare plushies and whatever other goodies I can get my hands on. Once you post on your rightful topic to claim I will get a present to you asap. Happy December to everyone! Hopefully people had a great turkey day and/or St. Andrews Day! I'm still rolling around in pumpkin pie, personally. Anyway, December on EX means a number of things! Snow will accumulate slowly on your farm, and once you have five pieces available, you can form a snowball and pelt a friend :D The player with the most snowballs thrown gets a prize, so go forth and throw snow at the world! Every day that you sign in you can go visit the Advent Calendar from the map page and pick up a fancy Christmas-y treat! and a new Monthly Item! We got the OK to have one of the rarest items in the game as this month's item! The fabled ~Lolosaurus Egg~ A lolosaurus egg can be used to give you one lab egg of the rarest (and most beautiful) of the EX dinosaurs! 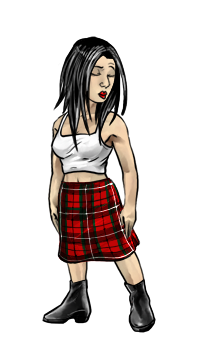 Clara wishes you a happy St. Andrews Day (Which basically is Saint Patrics Day with added Tartans!) from Scotland. 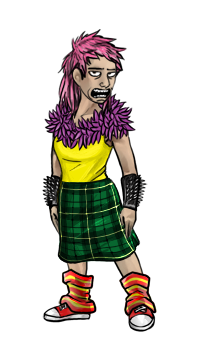 You might be delighted to see that to celebrate this day, she have drawn up some kilts for you to wear on your human avatars! It's the manliest piece of clothing you can ever own. Tomorrow, the annual Christmas Calendar will begin! Everyday in December you'll be able to visit the Calendar and claim a gift! But, since Kitty's been bustin' herself with EX mark II, we decided that instead of adding alot of new items, we'll instead revive some of the sassy items from previous years! This means, we'll have some old fancy items which some of you might never have seen before! And some of you might recognize them! And sometimes in December, the Annual Snowball Fight will begin! (I can't recall when, sssssh!) So get your arms ready, and fight for your honour! Have a great day and have fun wearing your kilts proudly! Happy thanksgiving everyone! I hope you all have great days. The thanksgiving plushie is, as every year, now stocking in the plushie store for today only. Grab one while you can! -Spotty: We're rolling around trying to make up some pretty cool contests for everyone to participate and enjoy!